Hardwood floor installation is one of the Woodchuck’s favorite jobs. We love to bring a classic, natural look to someone’s home can create a more comfortable space and increase its value. 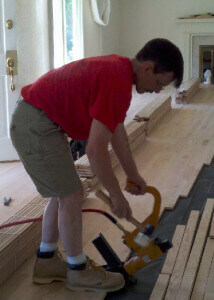 Hardwood flooring should only be installed on a dry, clean, level flooring base. Hardwood flooring must be installed on a sub floor. A sub floor is the base underneath the wood floor that lays on the joists. Sub floors can be made of plywood, OSB (Orientated Strand Board) or MDF (Medium Density Fiberboard). 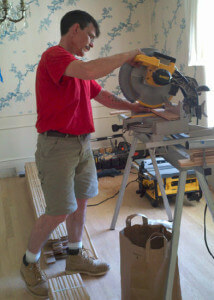 If a home has MDF, it must be replaced if you want to install hardwood flooring above it. The new hardwood flooring must lay perpendicular to the joists that lie underneath it. Once the floor boards have been cut to fit the length and width of the room, it is time to start laying the boards on the floor. Woodchuck Flooring pays a great amount of attention to how we lay the first few boards (and all those to follow) because it determines how all the other boards will lay in relation to the rest of the room. After the first couple rows of boards have been laid by face-nailing (hammering the nail on top of board) we then go in and blind nail the boards to the floor. This is done with a pneumatic flooring stapler. Some companies face-nail their boards excessively. This will cause nails to be visible in more areas of the wood. Rather than excessive face-nailing, we elect to hide as many nails as possible in the tongue portion of the boards. When the tongue can no longer be nailed because of closing at the wall, wood glue and construction adhesive are used to minimize face-nailing.